Chezzaray Professional Photography, Instant Magnetic Photo’s, and John’s Photo Booth Rentals showcase their professionalism on the largest party, wedding and event planning network, PartyPOP.com. PartyPOP.com features over 2 million highly accomplished and professional companies in the event planning industry including: Chezzaray Professional Photography, Instant Magnetic Photo’s, and John’s Photo Booth Rentals. Serving Los Angeles, California Instant Magnetic Photos provides colorful photos, taken by a professional crew, printed on magnets with a border and dedication customized to the event. The whole process is done throughout event, leaving guests with their own photo magnets to take home. Guests won't stop talking about the originality and creativity of these keepsakes making your event truly unforgettable. The company has received a lot of positive feedback from happy guests who have taken home these magnetic photo favors, even reporting that they have re-gifted them to friends and family members. Serving the Phoenix, Arizona area, John’s Photo Booth Rentals are great for parties, corporate functions and special events. These stainless steel photo booths are more than just a pole and a curtain. 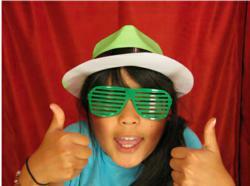 Photo booths can even be decorated with skins, illuminations and banners at the customer’s request. PartyPOP is the largest party, wedding and event planning online network.